Did the Nazis employ producer gas engines to create the poisonous exhaust used in the death camps of Treblinka, Belzec, and Sobibor? There is indeed no evidence that the Germans used producer gas engines to murder the Jews, whether in the gas chambers or the gas vans. There are several good reasons. Producer gas engines are highly flammable and inefficient. Holocaust deniers resort to empty speculation when they claim that the Nazis should have used producer gas engines, but didn’t, so engine exhaust was not used to murder Jews. This is a logical fallacy. What is a producer gas engine? How does it work? Producer gas engines have a special chamber attached to them where wood is burned. The gases produced by the burning wood are drawn through a pipe and are then used as fuel in a modified gasoline or diesel engine. During the war, gasoline, diesel, and aviation fuel were in short supply in the Greater Reich. They were also reserved for military uses. In response, the Germans began to convert many gasoline and diesel-powered vehicles to producer gas. What do Holocaust deniers say about producer gas engines? The major drawback to using producer gas technology, whether in the gas chambers or in the gas vans, is that carbon monoxide is flammable. It can ignite when it exceeds 12 percent of the atmospheric volume. Therefore, the risk of fire and/or explosion was very high. If producer gas technology was used, the gas chamber buildings would have burned to the ground and the gas vans would have easily blown up. This technology was not very useful or dependable as a method of mass murder. Interestingly, the fear of a producer gas engine’s flammability can be seen in one of Denierbud’s video clips. When Denierbud and his “innovative” friends make their model, this homemade gas generator is shown sitting far away in an open space. Denierbud and his “innovative” friends are nowhere in sight. Their distance from the engine betrays the potentially destructive danger that it poses. First, a producer gas engine cannot be started immediately. A fire has to be lit in the chamber and there is a waiting period. The burning wood or coal must generate the needed gasses. During peak periods in the death camps, transports arrived continuously. It would have been very inefficient to tinker with lighting fires, providing extra fuel, and closely monitoring the exhaust gases—all while risking possible fire and explosion at any moment. Second, a producer gas engine cannot be started or run in an enclosed space, like a garage. The users of the engine would themselves be risking death from carbon monoxide poisoning. In Treblinka, Belzec, and Sobibor, eyewitness testimony confirms that the engines were housed in nearby sheds or in rooms attached to the back of the gas chambers. If producer gas engines had been housed in a small room or shed, the “Gasmeisters” (“Gas Masters”) would have run the very real risk of dying along with their victims. Finally, no perpetrator, survivor, or bystander ever described the use of producer gas engines, but did describe either a gasoline or diesel engine. 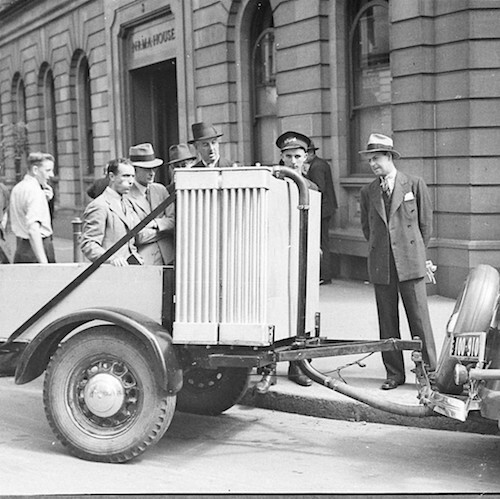 Gas producer vehicle, 1940. Sam Hood [Public domain or Public domain], via Wikimedia Commons courtesy of collections from the State Libraries of NSW. Despite the misguided assertions of Alvarez and Denierbud, the Nazis probably knew better than to utilize producer gas technology in the gas chambers of Treblinka, Belzec, and Sobibor. The same can be said of producer gas technology and the gas vans. The use of producer gas engines carried a high risk of fire or explosion and was potentially deadly to the perpetrators themselves. Further, efficiency and speed in the murder process was critical. Like a factory production line, the mass murder operation had to run smoothly and at top speed. Using producer gas engines or gas generators would have been inefficient and slow. Friedrich Berg, “Diesel Gas Chambers: Ideal for Torture—Absurd for Murder” (“Half a Million Poison Gas Generators on Wheels . . .”) at http://www.nazigassings.com/dieselgaschamberb.html. “One Third of the Holocaust” at http://www.youtube.com/watch?v=taIaG8b2u8I at approximately 24:00 to 26:00 minutes. Santiago Alvarez is possibly a pseudonym. Friedrich Berg, “Pat Buchanan and the Diesel Exhaust Controversy” at http://www.nazigassings.com/PatBuchanan.htm. Jamie McCarthy, “DThomas’ Diesel Retreat” (“Part 3 of 4”) at http://www.nizkor.net/hweb/people/nyms/dthomas/diesel-retreat-03.html.